2018-19 FRESH Registrations are NOW OPEN for Prathibha Applications (UG & PG). ** Students must be a citizen of India and domicile of Karnataka and he/she should be studied at least 7 years in Karnataka. ** Students from Backward Classes who have completed a Bachelor’s degree in postgraduate / postgraduate / professional degree / professional postgraduate degree in 2018 and scored an average percentage of 70% and above. Just follow the below steps to apply for the Prathibha Puraskar Scholarship For UG/PG 2018-19. 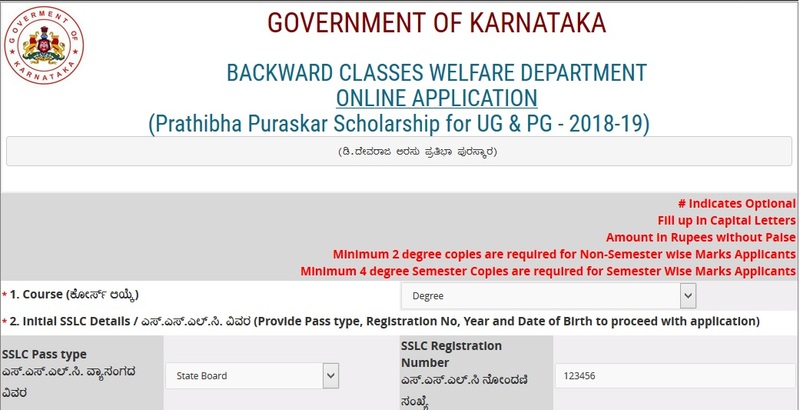 Step 1 : Go to the official website of Karnataka Backward Classes Welfare Department ePASS website provided above. Step 3 : After that read the instructions carefully, tick the check box to accept the declaration and Click on the “Apply Now” button. Step 4 : Please enter the following details to complete your Prathibha Puraskar Scholarship Registration. Note : If Your Village Name is not in the list,Please Select Near by Village and Write Your Village Name in Street/Road or Area Box. ** Enter Your House No./Door No. ** Enter Your Landline No. 9. Enter Your UID (Aadhaar) No. Step 2 : Then Select Prathibha Acknowledgement link under Student Services in the Menu bar. Evening : 2.15pm to 5.30pm. I have applied for Pratibha Puraskar scholarship and now that application status is ‘verified not selected’. What does it mean? I have applied for this scholarship on November 2018. I am a 3B category student. I want to know my scholarship status. Please explain the selection process of scholarship. Scholarship status shows that, application is verified and not selected as of today means, am I rejected? Please reply me. I have applied for this scholarship and the problem is the account number which I have given to the scholarship has been changed the bank has given new account number and they are telling the old account number doesn’t take any credits through NEFT and if any deposit received it will go back to the concerned government bank from where it is been credited only cheque (or) DD is accepted. So please can anyone help me out with this? Any solution is there for this? Kindly oblige. The amount of Prathiba Puraskara Scholarship is not credited in my account yet. Please take immediate action. I just came to know about it. Can I still apply? Kindly tell me, what are the other ways to apply for Prathibha Puraskahara scholarship. I have completed BE in Civil Engineering. Can I apply for this? I have finished my BE in EEE. I am unable to find the degree (BE) in the drop down list provided. Can you please tell me what I have to choose? I am a 2B category student. Can I apply for Pratibha Puraskara scholarship? and is it compulsory having 70% marks? I am a 2B category student. Can I apply for this scholarship?